Manchester United manager Jose Mourinho will face no further action on charges of using abusive language following their Premier League win over Newcastle United in October, the English Football Association (FA) said on Monday. An independent regulatory commission cleared Mourinho of the charge on Oct. 31 and the FA, who appealed against that decision last month, confirmed on Monday it had been upheld and the matter was now closed. 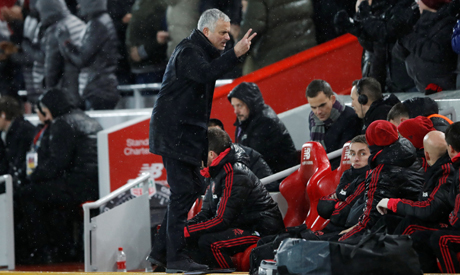 "The FA welcomes the original decision of the appeal board to uphold its appeal against Mr Mourinho for using abusive, insulting and improper language after the Manchester United v Newcastle United match," the FA said in a statement. "It also respects the decision of the Independent Regulatory Commission to dismiss the charge based on the legal argument submitted by Mr Mourinho. "Whilst we accept that the independent regulatory commission disagreed on this occasion, the FA wishes to make clear that it will continue to take action against participants for any form of abusive, insulting, or improper language or behaviour, which is directed towards a camera." The Portuguese coach was alleged to have directed an insult in his native tongue towards a camera that was tracking him down the touchline after the 3-2 comeback win. United are sixth in the league standings with 26 points from 17 matches after suffering a 3-1 defeat by Liverpool on Sunday.